1. Start by grinding the fennel seeds, black peppercorns and coriander seeds using a spice grinder or pestle and mortar until you have a fine powder. 2. Heat the oil in a large frying pan over a medium heat and add the blended onion along with the ground spices. Fry for 10–12 minutes, or until the onion starts to brown slightly. Add the garlic and ginger and cook for a further 5 minutes. 3. Add all the remaining marinade ingredients and cook, stirring every couple of minutes, for 15–20 minutes. You should end up with a gorgeously thick, glossy and fragrant sauce. Take off the heat and allow the sauce to cool then rub over the ribs and leave to marinate for as long as possible (overnight is ideal but an hour or two will do if you don’t have the time). 4. Preheat the oven to 140°C/275°F/Gas mark 1. 5. Place the ribs in a deep roasting tin and cover tightly with foil. Cook in the oven for 3–4 hours until the meat is meltingly tender but still holding on to the bones. 6. Remove from the oven, and pour the juices from the roasting tin into a small pan. Bring to the boil and then whisk in the sugar, vinegar and Tabasco. Reduce the heat and simmer for 10 minutes, or until the sauce has reduced by about one-third. 7. 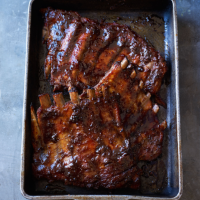 If you want to finish the ribs on the barbecue, place them over the hot coals and cook for 5 minutes, turning once or twice and basting with the finished sauce. If finishing in the oven, preheat the oven to 220°C/425°F/Gas mark 7, smother the ribs in some of the sauce and cook for 10–12 minutes, until the sauce starts to caramelise. 8. Serve with the rest of the sauce to dip the ribs into.